THE MODERATOR: Questions for Rafa. I think I did well, no? I happy about the way that I played. I'm in semifinals. That's a fantastic news for me. Just looking forward to playing a good match tomorrow. Q. Bjorn Borg said you were the greatest clay court player ever. 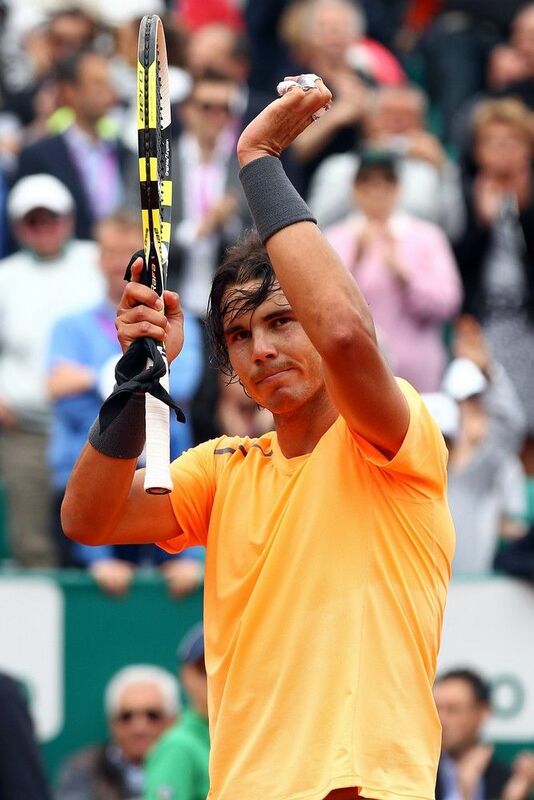 RAFAEL NADAL: Well, just can say thank you to him, no? But let's wait when I finish my career. Today I am playing. You have to look at that when both careers are finished. I really can't have a real opinion on that. My uncle always told me that when Bjorn go on court, everybody feels that he's unbeatable, no? So that's probably means that he can be the best of the history. I don't know how to explain, but I don't have this feeling. I don't feel unbeatable, no? He probably had that feeling. I think I have much better results that I ever dreamed, but I don't know if I am to the number of Bjorn. RAFAEL NADAL: Completely different games. I think Simon won the first set. RAFAEL NADAL: We'll see. Both matches will be different, but at the same time difficult, with the game goal: play my best tennis. If I play my best tennis, I will have my chances. If not, I will have much less chances. Q. Simon plays in the same way like you, with long rallies. Do you prefer that? RAFAEL NADAL: We play, I believe, a different way. RAFAEL NADAL: Long rallies but different way, no? His style of shot is much flatter. Is true that he's able to defend very well, have a very good comeback from difficult situations, something that can be seen a little of me. In general I believe that the game is difficult, no? And Tsonga, sure, he can put always in big trouble with the serve, forehand, playing aggressive, going to the net. That's can happen, no? Both matches are different styles. Seriously, I prefer the winner because I cannot choose. So I will prefer the guy who gonna win and try to do my tennis and try to play aggressive with both of them. Even if completely different styles of game, I always try to play my game, and will try to have the control of the point from inside against both. Q. 40 victories. It's a big number. Do you think could be the end one day? RAFAEL NADAL: Tomorrow. You never know. Q. As we asked to Djokovic, about the blue clay in Madrid, what do you think about this? Do you agree or not? RAFAEL NADAL: I not agree, sure. I don't support that. I don't support that for different reasons. First thing because you are in the middle of clay court season, and the clay here in Europe is red. So you have back to back Madrid and Rome. Madrid is the only tournament you are playing with high altitude, and then now you are putting a different color of clay. The tournament can't be too much difference between Madrid and Rome. That's first feeling. Second feeling is Madrid is enough big to not because they don't need to have this promotion for the tournament, because Madrid for themselves, the tournament is one of the best of the world. The history of the clay court season was on red, it wasn't on blue. You can tell me that I am traditional, but I am not. I love all improvements.What makes a really important tournament, what makes a really big tournament at the end is the history of tennis. This tournament is big because the history is there. Best players of history played in this court.My opinion, is a mistake. In my opinion, too, is always the same history, no? The players doesn't win nothing. The tennis doesn't win nothing. One person win. Only the owner of the tournament win something on that. So I cannot understand how the ATP accept that. We were against, the players. But the president vote for themself. Q. Did you have the opportunity to practice last year on this blue clay? RAFAEL NADAL: I didn't want. I didn't want to practice. That's the true. I gonna play Madrid for many reasons. But the only reason that tells me that I cannot go to Madrid is Madrid can destabilize my game for different reasons. I'm not the only one who thinks that. It's my country. It's one of my favorite tournaments of the world. I play at home. I play in Madrid. I play in front of my crowd. I love the tournament. But the decision, in my opinion, is not great. Q. Rafa, what do you think of the court here? RAFAEL NADAL: I talked about that yesterday, so that's enough. That was unlucky. I told him why happened that. But hopefully don't gonna happen again. Q. I didn't mean people falling over. There were a couple of strange bounces also. RAFAEL NADAL: On clay, strange bounces. In the best clay court of the history, you have bad bounces. That's true.